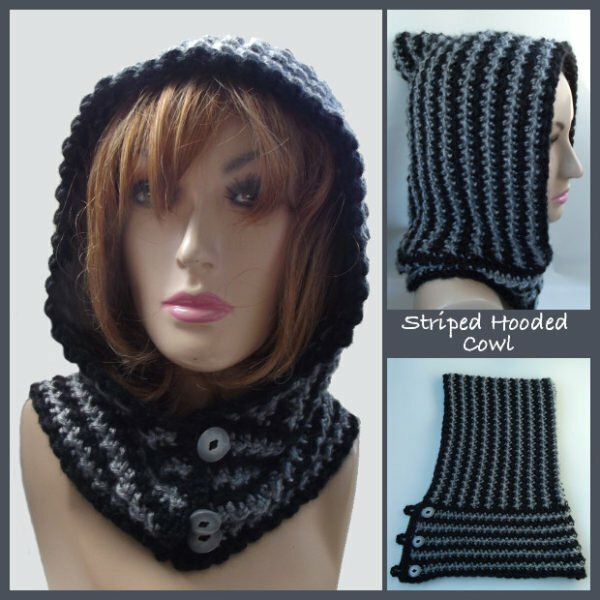 This striped hooded cowl crochet pattern is given in one size, but can be adjusted to any size as needed. The crochet hooded cowl is worked up in the crunch stitch, which gives you a nice solid stitch to keep you warm in the cold weather. It’s not bulky so it fits nicely under your jacket. And it’s closed with three buttons at the front for an elegant look. You might also want to check out this chunky cowl or the beginner hooded scarf crochet pattern. I followed basically the same design pattern as for my hooded scarves…which means that if you enjoyed them, then you’ll also enjoy this hooded cowl. I crocheted the hood first, then crocheted the cowl directly onto the bottom of the hood. Working along the bottom will stretch the hood out a bit, but that then gives you the cowl length needed to close it at the front. Other: Three 3/4 buttons to match. 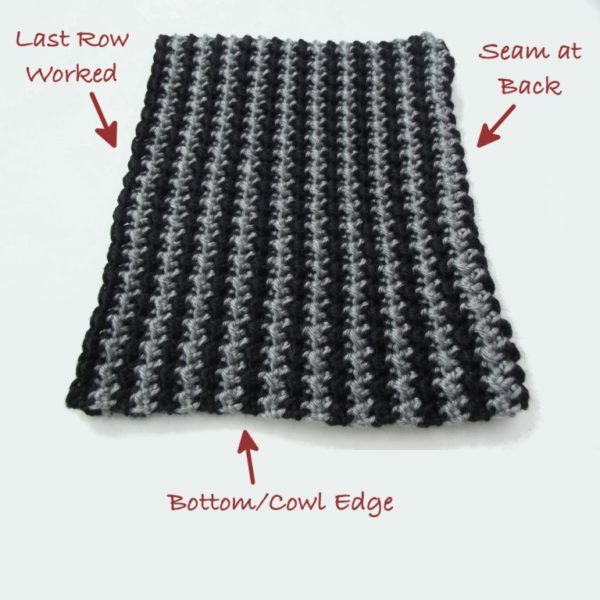 Finished Size: When laying flat, the cowl part measures 12″ across, and 5″ high. The hood measures 11 & 3/4″ high and 9″ from front to back. However, it is easy to adjust to fit any size. 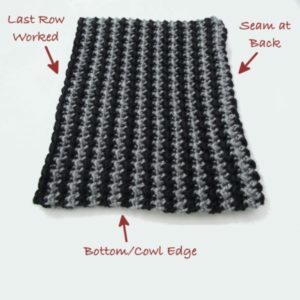 This hooded cowl is easy to adjust in size by increasing or decreasing the beginning chains in multiples of 2. 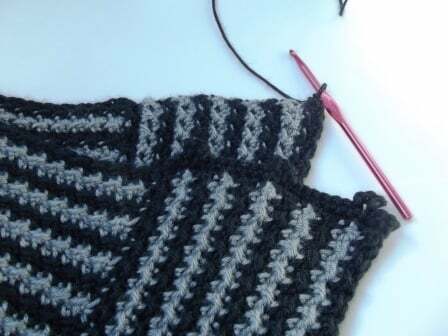 The new color is joined at the last stage of last stitch in previous row. Instead of fastening off, I carried the yarn up along the edge. Row 1 (RS): Hdc in 2nd ch from hk, sl st in next ch, *hdc in next ch, sl st in next ch; rep from * across. (82 sts) Turn. Rows 3-4: With CB, rep row 2. Rows 5-6: With CA, rep row 2. Rows 7-42: Repeat rows 3-6 changing the color after every two rows. FO at last row. Rows 2-22: Follow pattern as established above in rows 3-6. Row 1: Working along the edge of the cowl and starting at the bottom corner, stsc into first st along edge, sc into end of next 20 rows, sl st into end of last row. (22 sts counting stsc and sl st) Turn. Row 2: Ch 1, sk first sl st, sc into next st and into each st across. (21 sts) FO. Row 2: Ch 1, sk first sl st, sc into next 3 sts, ch 5, (sc into next 7 sts, ch 5) twice, sc in last 4 sts. FO. Attach 3 buttons onto the RS of cowl. Enjoy! How many skeins are needed to make this hooded cowl? Thanks. You’ll need two skeins… one of each color. If you made it in a solid color, you might get away with only one skein, but not sure on that. Bonnie, I wouldn’t see why it couldn’t be done in bulky. 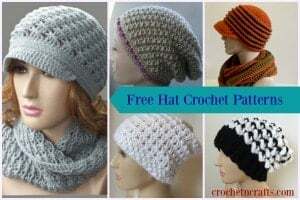 And yes, you can crochet this to any size that you want by increasing or decreasing the beginning chains in multiples of 2 – so you want a multiple of 2 plus 1. I absolutely love this pattern, thank you for sharing. I had a quick question, what is the difference between a sc and a stsc. A standing single crochet is basically the same as a sc, except that it is used to start a new row or round. It basically takes the place of a chain-1. It reduces the bulk and blends in better. I love this pattern! I’m making some cowl hoods and came across your pattern. Thanks for posting it.